How to use this lead: simply clip into the collar and make sure you have a firm grip on the handle. Remember to walk with your dog by your side or behind you. This lead has a stretch length, which extends up to 1.8 metres. Please be aware of this when out walking near roads or busy areas. This lead should be used by a responsible adult in safe open areas. Suitable for dogs up to 35kg. Stretches to over 1.8m. 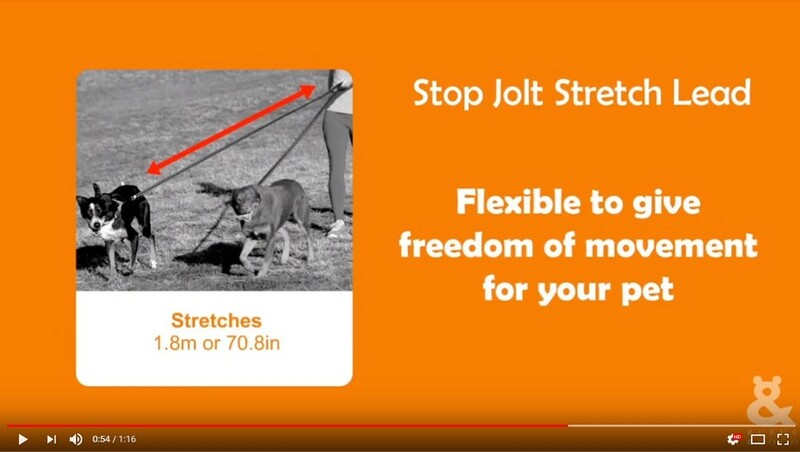 Q: What size dog will the Stop Jolt Stretch Lead hold? Q: How long does the lead stretch? "Yippee, walkies time… again! Thanks to the Rufus & Coco Stop Jolt Stretch Lead my owner now takes me for a walk all the time! Must be something to do with the extra stretch in the lead so my… ahem… pulling to see all the girls is a little less jolting on the arms. Whatever… it's workin' for me!"